The interscalene block (ISB) is the ideal approach to the brachial plexus for surgery on the shoulder. ISB is well suited to ultrasound imaging as the plexus is often surprisingly superficial and anatomical variants are common. The nerve roots forming the brachial plexus emerge from the intervertebral foramen between C5-T1. The nerve bundles then lie in a plane between the anterior and middle scalene muscles called the interscalene groove. This landmark is often marked by the overlying sternomastoid muscle. The roots of the plexus combine to form an upper, middle and lower trunk. These in turn each separate into anterior and posterior divisions as they pass infero-laterally towards the first rib. 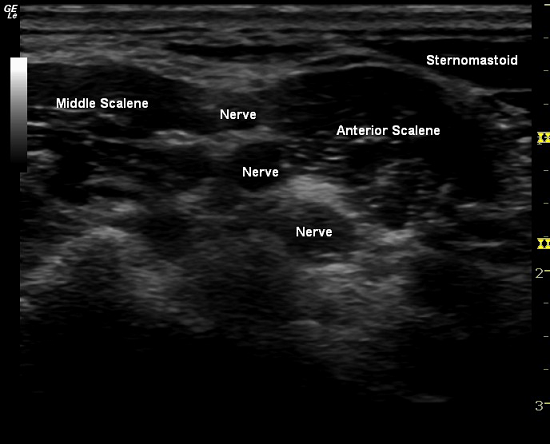 The typical sonoanatomy of the interscalene region is shown in the figure below. Anterior and superficial lies the dark, triangular shaped sternomastoid muscle. This is seen to taper to a narrow point laterally and its postero-lateral end marks the position of the underlying interscalene groove. Deep to the sternomastoid is the anterior scalene muscle. Further posterior is the middle scalene muscle and lying between are the trunks of the brachial plexus. The fascia overlying the scalene muscles often forms a slight depression at the level of the interscalene groove. The nerves are usually seen as dark round or oval structures with a slightly hyperechoic rim. Fascial planes can sometime be seen within the nerves as the US probe is moved inferiorly. Optimal imaging of the BP is achieved by scanning in the mid neck, below the level of the cricoid with the US probe angled slightly inferiorly. The block is best performed with the patient’s ipsilateral shoulder tilted about 30 degrees up from the supine position. 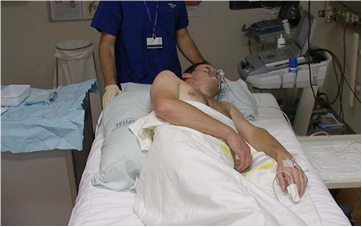 Ensure the patient’s head is at the very top of the bed and the ipsilateral shoulder is close to the edge of the bed also. Ideally the screen should be positioned above and in front of the patients shoulder so facilitate ease of needle imaging. This is best achieved with the US machine slaved to a separate LCD screen. High frequency linear probe 10-15MHz. Needle options are a 22G 5cm short-bevel needle, or a 20G 8cm tuohy needle. 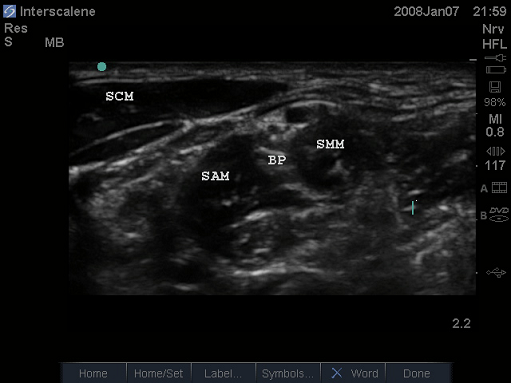 Longer needles are more echogenic. Perform a preliminary scan of the interscalene region to identify the probe position for optimal nerve imaging. Mark this point with a pen. Optimise the settings on the US machine at this point (depth, resolution, gain). Ensure that the patient’s position is optimal for the chosen probe position; i.e. move the patient if this is required to obtain the best view of the plexus whilst maintaining good line of sight between needle insertion point and the LCD screen. Prep and drape the patient. Cover the probe with a sterile sheath. The ideal needle insertion point may be slightly posterior to the edge of the probe. By moving the needle insertion point posteriorly, a longer but shallower needle trajectory is obtained (see above). After local infiltration, insert the block needle in the plane towards the brachial plexus. The needle is directed between the C5 and C6 nerve roots and guided into position just anterior to the scalenus medius muscle. This is usually no more than 1-1.5cm below skin. It is not necessary to pass the needle between the roots. The deeper components of the plexus C7 and C8 must be distinguished from the vertebral artery, and colour Doppler interrogation is important to confirm the position of vascular structures. The technique of hydro-dissection is very useful; inject small volumes of LA to create a space for the block needle to be advanced into. In this manner, circumferential spread of LA can be achieved around the plexus. If you wish to use nerve stimulation then 5% glucose solution enables injections to guide needle placement without preventing motor responses. For catheter insertion, an epidural needle is used. Passage of the needle through the tissues can make imaging more difficult. The larger needle creates more resistance and causes the tissues to pull away from the US probe. Care must be taken to avoid excessive movement of the needle in the direction of the nerves as it suddenly passes through a fascial plane. We usually inject LA in a deep and superficial plane prior to catheter placement. When placing the catheter, site the needle tip between the superficial and middle trunks of the BP, and the needle bevel directed towards the clavicle. Make a careful note of the needle depth. Insert the catheter to this depth and advance only 1 or 2 cm beyond if possible. Withdraw the needle. Note the depth of the catheter at the skin. 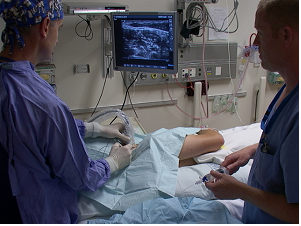 US imaging of the catheter can be used to help with final positioning of the catheter. Although the catheter itself is often poorly seen, tissue movement associated with jiggling the catheter can be seen and local or saline can be injected to help visualise the catheter tip. Catheter fixation is very important. Clean all the US gel off the skin. Dry the skin with tincture of benzoin if necessary. A small drop of liquid bandage or dermabondTM on the skin puncture site can help prevent LA leaking from this hole. The catheter is then covered with a Tegaderm or Opsite 3000 dressing. A stat-lock device is used to prevent traction on the catheter resulting in dislodgement. 1. Nerves roots are easier to identify if the probe is moved up (roots move deeper) or down (roots move towards the probe) the neck. 2. Best images are obtained with the probe at 90 degrees to the nerve which usually involves angling the probe caudally. 1. C6 can be identified by its large anterior tubercle and smaller posterior tubercle. 2. C7 has no anterior tubercle. The vertebral artery lies deep and anterior to the C7 nerve root.